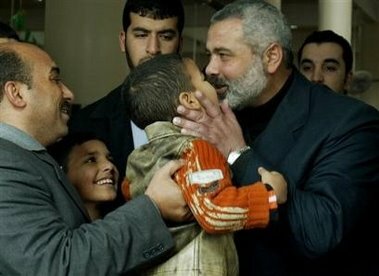 Apparently my warnings just weren't enough, and new Hamas Prime Minister Ismail Haniyeh's kissing affliction just continues to fester. Won't someone pull this poor guy aside and tell him he's simply got to stop the kissing cold turkey, before he completely frightens away an entire generation of future voters? Or at least sign him up for kissing lessons. // posted by AbbaGav @ 3/13/2006 12:36:00 AM | | | Permalink | EmailThis!